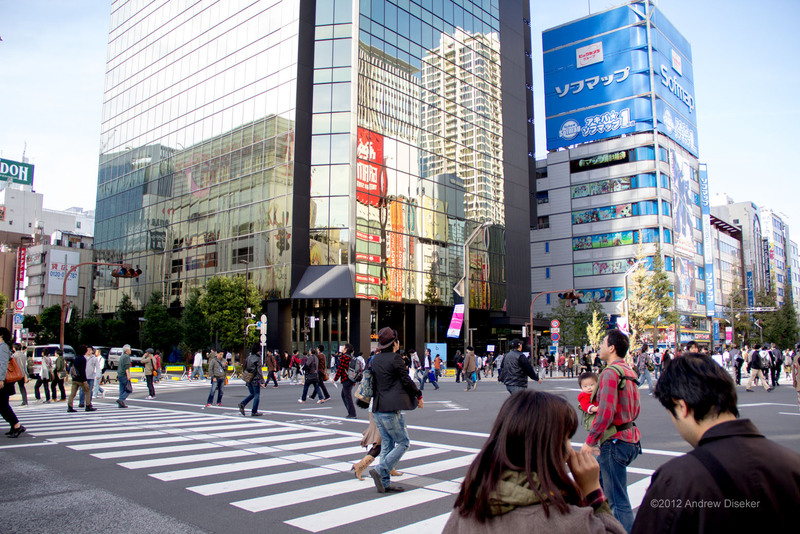 Nerdtour 2012: A bit of Akihabara – Nerdwatch! « Invisible driver in the drive-thru! On Sundays the main street in Akihabara is closed to vehicle traffic and opened up for pedestrians. This used to be much more festive, with cosplayers and musicians and all manner of people, but in 2009 a man drove through the barricade, killing some people, and jumped out and started stabbing and slashing others. This caused the police to recommend not having the pedestrian Sundays for a couple of years. When they finally started back to closing the street, the officials required more patrols, and far less “quirkiness” from people. So it’s a bit more bland than it used to be, but people still seem to enjoy the idea of walking out into what is normally a busy car-filled street, and (frisson of rebellion!) walking outside the crosswalks! Woo! Anyway, here’s one picture from the street in Akihabara. Tagged Akiba, Akihabara, Japan, nerdtour, Nerdtour 2012. Bookmark the permalink.